The Tony Davies Column covers a wide range of topics of interest to spectroscopists in both industry and academe, with an emphasis on data handling and processing. Read more about the Column Editor. Hafiz Abdul Azeem recently presented some interesting results from his work on atmospheric aerosols. Following their capture, he combined the optimisation of the extraction process with chromatographic separation and mass spectroscopic detection to identify various sources of pollution through their emission marker fingerprints.1 One spin-off of this work has been the use of a specific biomarker from cellulose combustion to potentially warn of low-heat smouldering in, for example, agricultural materials in bulk storage. The authors tell us about an initiative to promote ­analytical ­spectroscopy to a range of people from school children and their parents to Dutch chemists. PAT is the key. Tony raises the question of whether those implementing change consider sufficiently the effects on those who need to implement it or who will be affected by it. I am sure that this has wider implications than just in industry and business. Are your spectroscopic data FAIR? FAIR, which stands for Findable, Accessible, Interoperable, Reusable, is an essential framework for the future of analytical data. Tony has taken the opportunity of a recent conference in Amsterdam to update readers on FAIR and how it affects spectroscopic data. This column explores the initial results extracted from the survey in the last issue into the training the next generation of colleagues currently receives in analytical chemistry. Do you educate students who may go on to work in industry, or are you involved in assimilating students into your team? If so, you will really want to read this issue’s Tony Davies Column. Tony and co-authors, Jennipher Dania and Joachim Zahradnik, are undertaking two surveys to explore this area: one for Academics and one for Industrialists. Please do spend the very short time needed to complete one (or both) of these surveys. Significant research is underway globally into both improving corrosion protection as well as removing chemicals of concern from existing corrosion protection coatings. This is because the cost of corrosion in developed economies has been consistently shown to lie in the range 2–4% of Gross National Product. What developments do you need to work more efficiently? Tony Davies continues his quest to find out what you all need to work more efficiently. You will remember that in the last issue, Tony introduced his survey to discover what developments were needed in spectroscopy by readers. Some of the initial responses are explored, and Tony finds that he has opened a “can of worms”. What developments do you need in spectroscopy? It is your turn to contribute: to the potential development of new spectroscopic instrumentation! Tony argues that many spectroscopic fields have seen little real development: and there are many reasons for that. Now, you have your chance to let us and, more importantly, the instrument vendors know what innovations (hardware and software) you would like to see in order to help you in your work. There is a short (three-question) survey ; please use this opportunity to help influence the future of the instrumentation you will be using. Tony Davies and a number of others consider collecting supplementary spectroscopic data. Like Eurospec, the plan is to use such supplementary data not only to enhance the published paper, but also to aid thorough peer-review by allowing reviewers access to the full data rather than, as Tony puts it, “low-resolution images of data”. I’m sure you will be interested in a look at the future through this column. Colette Germon, Tony Davies and Paul Jones look at “Combining teaching chemometrics, with attenuated total reflection–infrared spectroscopy and food authentication”. They describe a teaching project based around the detection of food fraud. It is a good example of teaching spectroscopic data handling and advanced analysis techniques. They have investigated how adulteration and misrepresentation of meat and fish can be detected, as well as whether frozen and then thawed fish could be differentiated from chilled fish. Developments in hardware, higher field instruments, better multinuclear probes including cryoprobe options, spectrometer control systems and also desktop NMR data processing software have all combined to make the measurement of inorganic nuclei a potentially commonplace and very helpful, often complementary, technique to other spectroscopic analytical tools. How standard are your standards? Tony Davies and Robert Lancashire ask “How standard are your standards?”. They describe a number of the organisations working with standards that affect the spectroscopy field. It looks as if free access to these may be the only way to ensure their longevity. What is the collective noun for solid-state nuclear magnetic resonance spectrometers? Tony Davies and Steven Brown explore the solid-state nuclear magnetic resonance spectroscopy facilities at the University of Warwick, UK. In this article, it is discussed why International standards need to keep pace with the innovation in analytical equipment and practices. Tony Davies has interviewed Gerard (Gerry) Downey who has just retired from the Irish National Agriculture and Food Research Institute, Teagasc. Gerry will be known to many of you, particularly those who work in the fields of chemometrics, NIR spectroscopy and food & ag. I must have known Gerry for over 25 years and currently work closely with him on the publication of NIR news, so I am particularly delighted that Tony has chosen to highlight his career. Central spectroscopic data systems: why are chromatographers so much better equipped? In the Tony Davies Column, Tony is getting jealous of chromatographers in “Central spectroscopic data systems: why are chromatographers so much better equipped?”. Replicating the power of chromatography data systems for spectroscopic data is not that easy. “Spectroscopic data handling at petabyte scale” shows how one institute is dealing with truly huge amounts of data, both in its collection and in its distribution to scientists for interpretation and analysis. At the same time, the institute has been able to incorporate best practice around the FAIR Data Stewardship of scientific information. In the Tony Davies Column, Tony looks at “Raman imaging of difficult surfaces”. He looks at a number of different approaches to dealing with uneven samples, as well as reviewing instrumental improvements that have made Raman imaging a viable analytical and diagnostic tool. In this column, Tony describes “A new approach to identifying unknown trace level analytes by tandem mass spectrometry without reference spectroscopic database support: CSI:FingerID”. This allows for tandem mass spectrometry data to be used to identify unknown analytes from common molecular structure databases where reference spectroscopic data is unavailable. 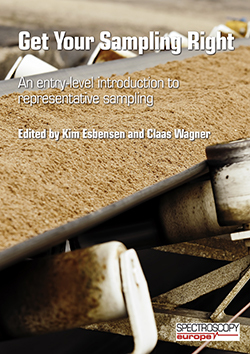 Read this e-book of the complete collection of Sampling Columns published in Spectroscopy Europe.